John Rogers Nordyke of Ames, known to friends and family as “Jack”, passed away on January 31st, 2019, at the age of 77, at Green Hills Nursing Home. Per his wishes, Jack has been cremated. A gathering of family and friends will celebrate Jack’s life on Saturday, March 16, 2019 from 1 until 4 pm at Adams Funeral Home. A private burial will occur at Ames Municipal Cemetary. John "Jack" Rogers Nordyke was born on August 7, 1941 in Kansas City, Missouri, to Hollis and Garnette (Rogers) Nordyke. He was raised in Ames, Ia, where to took photographs of Ames High sporting events and developed his lifelong love of fishing, hunting and all things outdoors. After moving to South Dakota for college, he met his wife Barbara "Bobbie" (Forde) Nordyke through mutual friends and they were married in Brookings, South Dakota, on June 6, 1964. 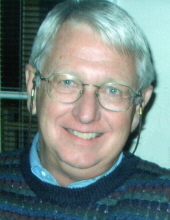 Jack earned a double major in Business Management and Journalism, receiving his BA from South Dakota State University in 1965. They moved to Estherville, Ia, where Jack worked for 2 years in advertising at the local paper. Jack and Bobbie returned to Ames where he worked at the Ames Daily Tribune alongside his father. Jack spent many happy years working in advertising, business management, and as an eventual co-owner, until the paper was sold in 1988. Ever the salesman, Jack became a Real Estate Agent with Hunziker & Associates where he enjoyed working with old friends and introducing clients to the community he loved. Throughout his life, Jack was active in the business community and cherished his many, long-standing friendships. The annual fishing trips to Canada were a definite highlight of each year! Jack also had a particular soft spot for dogs, and he enjoyed many hunting and companion animals throughout his life. Jack and Bobbie had three daughters and the family spent much of their free time at their lake house in Okoboji. Upon their retirement, Jack and Bobbie split their time between Ames and Okoboji, until Jack’s diagnosis of Lewy Body Dementia. Jack is lovingly remembered by his wife Bobbie, his three girls Lynn (Jim) Fenney, Kelly (Mike) Messingham, Juli (Russ) Tatar, his 6 grandchildren, Maya Fenney, Gavin, Ashton and Logan Tatar, Caitlin and Nolan Messingham, and his sister Linda Shortridge. In lieu of flowers, the family requests that memorial donations be made to Ducks Unlimited and Story County Conservation (SCC). To send flowers or a remembrance gift to the family of Jack R Nordyke, please visit our Tribute Store. "Email Address" would like to share the life celebration of Jack R Nordyke. Click on the "link" to go to share a favorite memory or leave a condolence message for the family.